Download the Modern Intranet eBook - it's free! Want to know how a modern intranet and digital workplace can knock your socks off? You want an intelligent, social and easy-to-use intranet software? Easy to say, but hard to do. 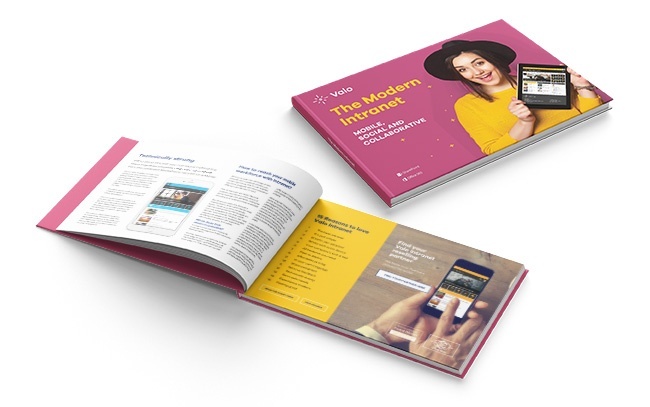 Read our new eBook “The Modern Intranet” to know how to succeed with your intranet, and what things you should bear in mind when planning it. The free eBook is all about intranet trends and best practices, top features, modern intranet requirements and business use cases. Effortless working days await! Intranet in a Box - It's a new way to build and buy your intranet! Evolution of SharePoint - Microsoft brings it back to the spotlight! This eBook will help you to understand what are the things every great intranet should have, and how to define a modern intranet software. Everything starts from the purpose of the intranet! You will also get the latest information about the most popular intranet features, how to improve a digital workplace with Office 365, and what is the future of Yammer, a private social network. In addition, you will get to know the Microsoft trend and a new turn key solution called a ready-made packaged intranet. Last but not least, don’t forget your users basic needs: finding information, being informed and getting the job done. The Modern Intranet eBook is an excellent guide for those people who are responsible for or interested in an intranet administration, content management, strategy, or policies. Download your free eBook today! Just fill out the form and we'll send it to you instantly.